The Turkish scene features the Sultan’s favourite girl, Zaide, and the palace gardener, the Bostangi, represented in this instrumental concert by the orchestra’s flautist and bassoonist respectively. I’m happy to have this chance to revisit L’Europe Galante, which I first directed at the Amherst Festival. Surely this is the perfect choice for the European Day of Early Music, and we are planning to start a staged production of the full opera with OPERA OMNIA at Moscow State Theatre ‘Natalya Sats’. Meanwhile, here in Tallinn, our Spanish Entrée also includes variations on Les Folies d’Espagne, and the choice of movements for each of the ‘Suites’ we have constructed favours dances for which period choreographies survive, many of them published in Feuillet’s Chorégraphie (1700). See also ALK’s solo recording here. Whilst French baroque music poses technical challenges for performers – intricate bowings, complex ornamentation – it offers easily appreciated delights to listeners: elegant dances with a lively swing, dramatic contrasts of theatrical characters. The complete program and program-note is below, but as the title promises, this post takes a closer look at the first movement of Rebel’s elemental suite, his famous depiction of Chaos. Many listeners will know this from Christopher Hogwood’s (1980) recording with the Academy of Ancient Music here. When I first performed Les Élémens, I had to work from the published Ur-text edition. As always, such editions are a mixed blessing. No matter how scholarly the editor, no matter how carefully they own up to their own editorial interventions, there is always more to be discovered in the primary sources. There is also the subtle question of whether variant sources should be conflated into a single version: perhaps these variants are neither ‘better’ nor ‘worse’, but just different. It would be historically appropriate to perform any one particular variant, but any conflated version is a modern construction! So, whilst secondary sources offer valuable commentary, any serious performer will prefer to see the original material for themselves. I have seen mention of surviving instrumental parts, but if these exist, I haven’t been able to study them. So if some Rebel specialist can point me in the right direction, I’d be delighted to know more. I’ve also seen a statement that no score exists. However – God bless IMSLP! 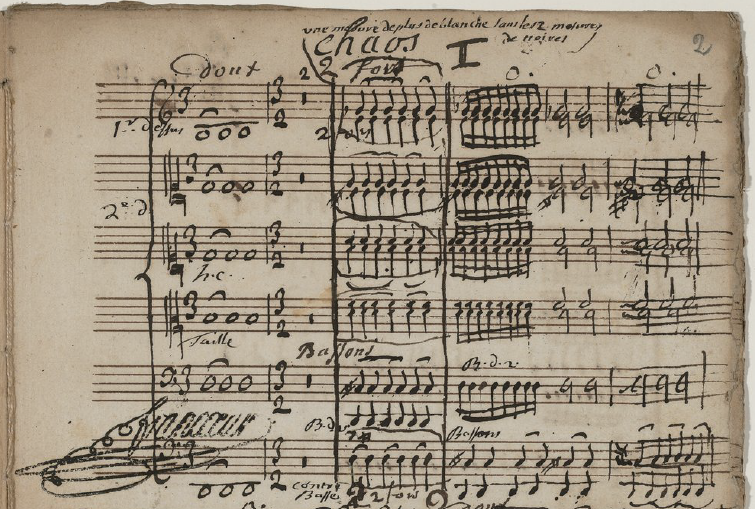 – the original (undated) printed score and Rebel’s c1737 MS are now freely available online (print of the complete suite and manuscript of Chaos only). As you can see, the print is beautifully clear. 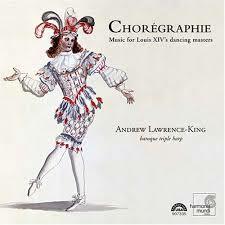 It designates the work as Symphonie Nouvelle, and presents the suite of dances in a different order to that chosen by Hogwood: Chaos – Air pour l’Amour – Air & Chaconne – Ramage – Rossignols – Loure – Tambourins – Sicillienne – Caprice. The Chaconne is clearly notated to continue directly from the preceding Air, and that Air has nothing of Loure (Hogwood’s title) about it. Rather, the rhythmic structure of the Air corresponds to a triple-metre Chaconne (phrases go across the bar-line, 2 3 / 1), though the harmonies and four-bar patterning of Chaconne are not present. The print includes Rebel’s explanatory article, which reminds us of the close links between music and dance in baroque France: the concept of the four Elements offers a ‘pleasing variety’ of different music genres as well as costumes and dance-steps. Rebel describes the introductory movement, Chaos, as ‘natural’. In baroque terms, this implies an absence of artistry, the abandoning of the organising principles that would normally guide the transformation of raw nature into sophisticated art. And thus the famous first chord, containing every note of the scale simultaneously. Little by little, in 7 sections (suggesting the 7 days of Creation), musical organisation, principles of dissonance and resolution are imposed, and once the fog of Chaos is dispersed, a well-constructed final cadence brings this movement to a harmonious close. In parallel, Rebel uses particular instruments to represent each element: Water (flute), Earth (low strings), Air (piccolo), Fire (violins). To begin with, the four elements are entangled and misplaced, but gradually they find their proper places, so that at the debrouillement (de-misting), each instrument, each element is correctly ordered. If the print is clear, the manuscript gives an impression of primeval Chaos before the fog cleared. Obviously, an earlier version of the piece is being adapted, with instructions to play certain bars twice, to add an extra bar of minims etc. But even when all the last-minute instructions are applied, the MS remains quite different from the print. The famous, shocking dissonance of the print’s first chord is delayed until bar 4: the MS begins doux (softly), with a single note, low D, in unison. The flute part is given separately, on another page, leaving more space for the violas. And there are two staves for the bass section, shared between celli, bassoons, basses and continuo. Both bass staves feature low A (a third below a modern cello C-string), also seen in the single bass stave of the print. But there is no hope of filling in from the MS the viola parts missing in the print: the two versions are too different. At most, the MS gives an example of the composer’s viola writing, that can be imitated by present-day editors/directors. But the viola staves show frequent confusion of clefs, and many problematic passages defy any neat solution. So the MS is a fascinating snapshot of Rebel’s creative process, of work in progress, but has limited use as a supporting source for the print. One could edit up the MS version, trying to make sense of all the additional instructions and reconciling this with the separate flute parts. Perhaps once audiences have become accustomed to the surprise of the chaotic opening dissonance, one could shock them anew by performing the MS version, with its soft, unison start! What does emerge from parallel study of both versions is that Rebel’s work can be played by a standard French baroque line-up of five-part string ensemble, 1 bassoon and 2 high-wind players (who double flute, piccolo and oboe). Although the scores suggest multiple ‘flutes’ and ‘petites flutes’ (piccolos), only two high wind parts are notated at any given moment. With one player making a quick change from flute to piccolo and back, two musicians can manage everything. Usually, oboe and flute parts were played by the same musicians, and oboes are not mentioned at all in the Chaos. There is one horn part and one trumpet part – the D trumpet part includes the note treble c#, which is not part of the harmonic series. The violin and viola parts include many chords – it’s not clear if these would have been double-stops or divisi: in my own parties de remplissage I chose to make all chords playable as double-stops. So that was my task for this month – organising Chaos! My Creation – the program and note – follows below. The word ‘Baroque’ suggests to us today the thrilling virtuosity of Vivaldi’s concertos and Italian operas; the intricate complexity of Johann Sebastian Bach’s Art of Fugue; perhaps even the exotic rhythms of Spanish and South-American music. But in the late 17th century, a fourth national style was the dominant element across most of Europe: the noble art of French dance. It was the French who defined the dance-types that form the conventional baroque Suite – Allemande (originally an actual dance, but later a dance-like prelude), Courante (the noble entrance dance of Kings), Sarabande (elegant poses balanced on one leg, alternating with sudden fast turns and jumps), and Gigue (a lively leaping dance). The Loure is an elegant, slow version of the Gigue. 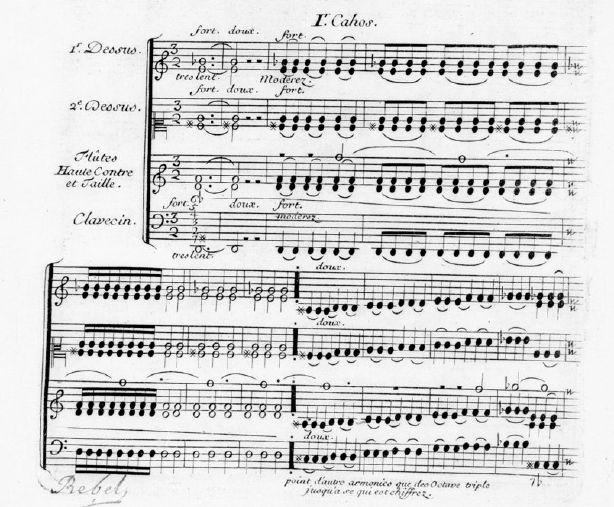 The Chaconne and its minor-mode cousin, the Passacaille were grand ensemble-dances for the end of an opera, in which solo dancers and corps de ballet, solo singers and chorus, solo instruments and the full orchestra, would alternate in choreographically complex and harmonically expressive variations on a four-note descending ground-bass. Composers and performers were free to assemble sequences of all kinds of dances, united by tonality, but contrasting in every other way. Each dance is quite short, and instantly recognisable, so that the audience can enjoy rapidly changing contrasts from one dance to the next. At a formal ball or Assemblée, courtiers would dance couple by couple, changing place in strict order of aristocratic precedence. In the theatre, each dance would feature different characters, in brightly coloured and contrasting costumes. French composers and playwrights linked sequences of dances with spoken or sung dialogue to create a variety of dance-based theatrical genres. As the 17th century progressed, plots became more serious. Dances were no longer merely entertainment, but became central to the dramatic story and to the artistic structure. Around 1700, however, the trend from charming comédie-ballet to serious tragédie en musique was reversed with a new genre, the opera-ballet, dramatically unified and formally structured, but more light-hearted than the tragedies. Each dance-type has a characteristic rhythm, corresponding to its particular dance-step. This vrai mouvement – true movement – guides not only tempo and rhythm, but also ‘swing’. 17th-century French musicians played medium-fast notes inégales – with a subtle swing – just as jazz musicians do today. The vrai mouvement is the ‘groove’ of each dance, giving a specific identity and feeling: courtly, theatrical or rustic; tragic, happy or comic. In France, dancing and music were inseparably linked. The best violinists were also the best dancing-masters. Jean-Baptiste Lully was an expert dancer, violinist and singer, as well as the most famous composer of the age. Bow-strokes for the violin were light and airy, just like a dancer’s leaping feet. A flourish of the dancer’s wrist, or a brilliant swivel of the feet in mid-air correspond to the many trills and ornaments in French music. Dance choreographies transform a simple straight-line walk into an elegant and stylish display: similarly, underneath all the decoration of French baroque music there is a straightforward melody, often taken from folk-music. In 1698, composer Georg Muffat summarised Lully’s violin style, cataloguing bow-strokes and left-hand ornaments for violinists. Dancing-masters published collections of choreographies, detailing every step of the most admired theatre and social dances. 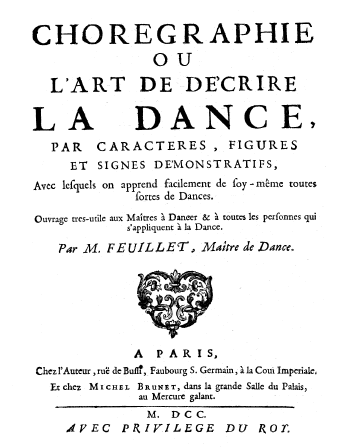 Muffat’s Florilegium and Feuillet’s Chorégraphie fed an insatiable public demand for new dances, new entertainments, as the dance-craze spread across Europe. Campra’s L’Europe Galante (1697) reflects the latest international fashions with scenes set Spain (the Sarabande, Chaconne and Folies d’Espagne were Spanish imports) as well as France itself. Campra’s finale is set in exotic Turkey, contrasting the passionate love-affairs of beautiful girls in the Sultan’s harem, with the wild exuberance of the palace gardeners, the comic Bostangis. In England, Purcell’s music combined Italian counterpoint with the ‘gaiety and fashion’ of French dance-styles, presenting Dido & Aeneas at the girls’ school founded by dancing-master Josias Priest. This was also a period of change in the scientific understanding of the natural world, from Galileo’s Mecaniche (1599) to Newton’s Principia (1687, 1713 & 1726). New theories had to be reconciled with older models and with religious doctrine. The concept of Four Elements was expounded by Plato and Aristotle and survives today as the four states of matter (solid, liquid, gas and plasma). The classical Four Elements are Earth, Water, Air and Fire. These were all mixed together in the primordial Chaos, but during the Seven Days of Creation, they were disentangled so that each Element could find its proper place. Lully’s pupil, Jean-Féry Rebel associates each element with particular instruments. 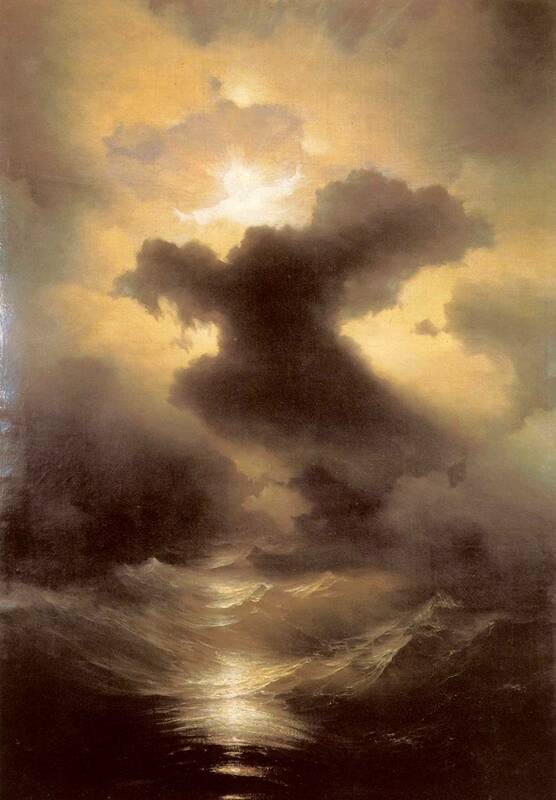 As they emerge from primeval Chaos, the characters of his ballet are: Water (L’Eau – Flute), Fire (Le Feu – violins), Air (L’Air – Piccolos), Earth (La Terre – cellos and basses). 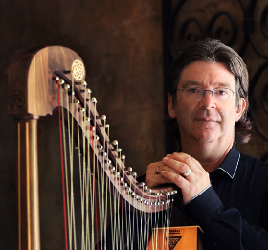 String tremolos and bassoon create the sound-effect of Fremissage (earthquakes). In the following dances, low violins also represent Earth, and flutes represent Water. The piccolos create the stage scene of Ramage (green-leaved trees), where we hear Rossignols (nightingales) represented by the flute. Meanwhile, when harmony emerges from chaos on the seventh day of Creation, a fifth character appears in the circle-dance of a Rondeau: L’Amour (Love). 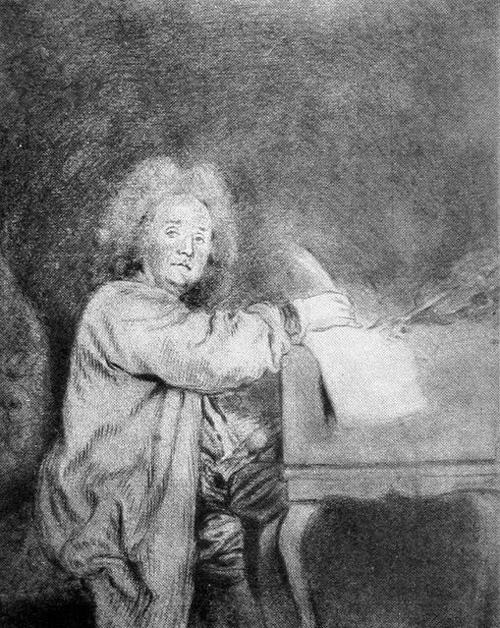 French baroque music was created by the collaborative work of dramatists, choreographers and composers. It was performed by singing actors, dancers and instrumentalists. So as you listen to these Suites, imagine casts of actors and troupes of dancers. See elaborate stage sets and thrilling machine-effects. Place yourself amidst the splendour of Louis XIV’s Versailles and the delights of André Le Nôtre’s formal gardens. Look for birds singing in the trees; for the enchanted palace of the witch, Armide, being consumed by fire; for the chivalric knight Amadis; for beautiful princesses in love and a noble Queen lamenting; and for a Turkish gardener busy with his shovel!